The domain within your query sequence starts at position 1225 and ends at position 1360; the E-value for the LamB domain shown below is 1.95e-57. Laminin is a large molecular weight glycoprotein present only in basement membranes in almost every animal tissue. Each laminin is a heterotrimer assembled from alpha, beta and gamma chain subunits, secreted and incorporated into cell-associated extracellular matrices. The laminins can self-assemble, bind to other matrix macromolecules, and have unique and shared cell interactions mediated by integrins, dystroglycan, and other receptors. Through these interactions, laminins critically contribute to cell differentiation, shape and movement, maintenance of tissue phenotypes, and promotion of tissue survival [(PUBMED:10842354), (PUBMED:15363809)]. The different laminin chains share a 600-residue domain I/II which oligomerises into a rod-like coiled-coil structure forming the long arm of laminins. The N-terminal short arms consist of rod-like elements (domain III and V) formed by tandem arrays of laminin-type EGF modules and several globular domains: domains IV and domain VI (laminin N-terminal). 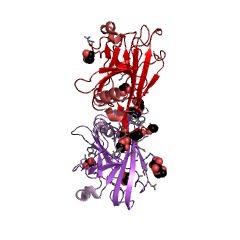 All alpha chains share a unique C-terminal G domain which consists of five laminin G modules [(PUBMED:3182802)]. 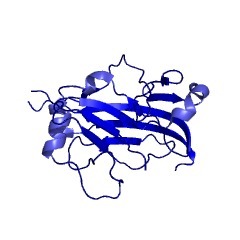 Laminin IV domain is also found in the perlecan protein, an integral component of basement membranes, which serves also as an attachment substrate for cells, but it is not found in short laminin chains (alpha4 or beta3). The function of this domain is not yet known. There are 7645 LamB domains in 4077 proteins in SMART's nrdb database. Taxonomic distribution of proteins containing LamB domain. This tree includes only several representative species. The complete taxonomic breakdown of all proteins with LamB domain is also avaliable. Click on the protein counts, or double click on taxonomic names to display all proteins containing LamB domain in the selected taxonomic class. SwissProt sequences and OMIM curated human diseases associated with missense mutations within the LamB domain. This information is based on mapping of SMART genomic protein database to KEGG orthologous groups. Percentage points are related to the number of proteins with LamB domain which could be assigned to a KEGG orthologous group, and not all proteins containing LamB domain. Please note that proteins can be included in multiple pathways, ie. the numbers above will not always add up to 100%.